Planoptically Polished with Phantom Coating Group (PCG). Drastically improves contrast for all reflector telescopes, without loss of brightness! Many companies claim the Neodymium filter being their idea in the meantime – here is the real story: When Baader Planetarium had taken over responsibility for Zeiss Amateur Astro Products Division in 1996, among many other product ideas (which are gradually entering the market…), one of the most intriguing was a selective bandpass- filter to cut a good part of light pollution and greatly intensify the H-alpha wavelength of the visual spectrum – working as a whole like an RGB-Intensifier. This was achieved with the help of the rare earth element NEODYMIUM, whose effect as astronomical filter never had been tested before. The effect is very impressive though, especially if applied on the planets Jupiter and Mars, while at the same time considerably darkening the sky background. Many thousands of Neodymium Filters have been distributed since then, being one of the most effectiveand economical tools for the amateur. The latest production run features multilayer coatings on both sides, which makes the genuine NEODYMIUM Moon & Skyglow-Filter the brightest in this family of filters. Greatly intensifies surface details on Mars, Jupiter and Moon – and enhances many Deep Sky galaxies and nebulae against the background sky. Transmitts a maximum of light, while blocking unwanted skyglow and many street light emissions. Especially effective on small economy telescopes which cannot benefit from expensive narrow-band nebula filters due to the huge light-loss involved. Unique selective blocking feature of the NEODYMIUM element greatly reduces glare, without reducing recognition of important colour and brightness variations. Transmission within the selected wave bands exceeds 95%. due to cutting all unfocused light – an absolute MUST for digital imaging. Planeoptically polished! Retains full image resolution – even at highest magnification, way above 200 times, or during eyepiece projection work – even in front of a binocular viewer. Ultrahard and durable Ion-beam hardened coatings, may be cleaned anytime without fear. No image degradation as with `flame polished` filters. Available in 31.7mm and 50.8mm size at very affordable price. 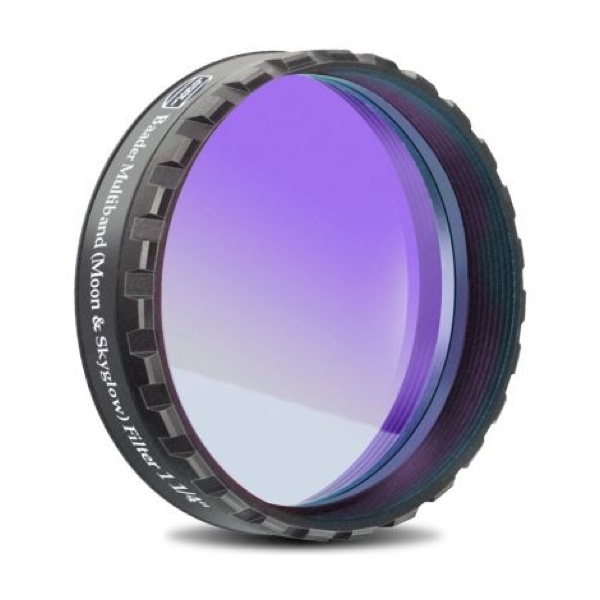 Non-vignetting filter cells, larger in aperture than any competing design, featuring a CNC milled `crown` for ease of handling and attachment. If you have never seen the GRS (Great Red Spot) on Jupiter – or surface features on Mars – with this filter you will!